Designing a new website comes with certain challengesTalking of the prevalent web development frameworks, the ‘Waterfall’ and the ‘Agile’ methodology of web development are quite the popular ones. Being debated on their effectiveness, the two methods have their own pros and cons. It is highly recommended that you choose the right method before you start building upon your next project. In this blog post, we explore through the depth of the Waterfall and the Agile processes to help you choose the right one for your next project. Here is a detailed analysis of the two methodologies along with their advantages and disadvantages. This is more of a traditional approach to web development. This methodology follows a downstream series of actions that define the completion of a particular project. Right from the conception of the project idea to all the way up to production, the entire project timeline is broken into distinct stages that are only taken care of in a strict sequence. Just like the name, the Waterfall methodology of web development only travels downstream i.e. 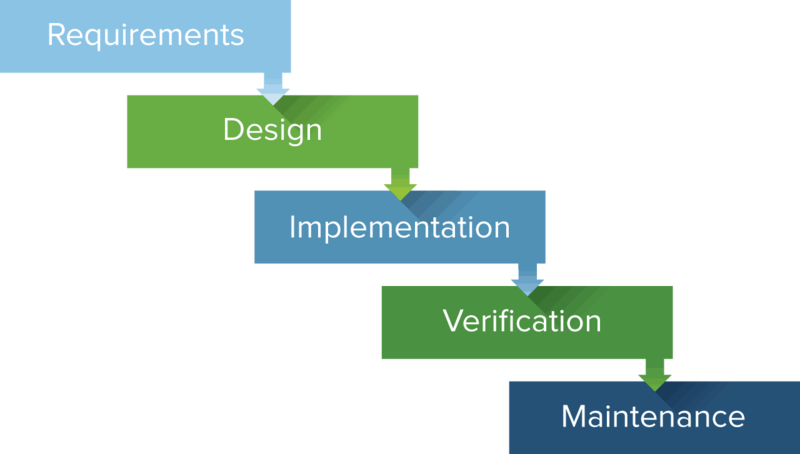 the team on task cannot go back to the previous phase without completing the entire development cycle. Only after completing one step in the cycle, the developers can move onto the next one. The Agile method of web development is flexible and team-centric, making the approach quite popular. The development stages under this method run in a parallel sequence, making way for revisions and feedback. We all know that web projects need a lot of going back and forth in order to introduce improvements in their architecture. Focussed on the outcome of teamwork involved, the Agile method provides ample room for improving upon the project as constant user feedback is involved. The general approach to the Waterfall method has 8 simple stages which are commonly followed by the web development folks from around the world. Let’s get to know the stages. Conception: This stage is where the idea for the web project is born. Working on a rough estimate of how things are expected to function for the project, the project managers run a cost/benefit analysis and create a scope documentation for the project. Initiation: The scope documentation from the first step is now carefully expanded with a clear picture of what deliverables are expected at the end of the product. This step is about further defining the objectives and the purpose of the entire exercise. Analysis: As clearly named, this step is about running an analysis for ascertaining the requirements of the resources and the tools that would eventually be needed to complete the project. These requirements are then duly noted in the scope documentation. Design: This step is a crucial one in the Waterfall method of web development. Here, the web developers and the designers pitch in their ideas on a storyboard in a pursuit to arrive on a mockup of the project. This creates a space for looking into the task list and defining the team goals. Based on these, a project plan finally shapes up. Coding: This is where the engine starts to work. The task list defines the roles and the team members finally get to work. The flowchart commands the actions and the actual work gets started i.e. the app or the website development. Testing: Once the pieces are assembled and the product is ready, the team begins to test it for any errors. In case a bug is found, the team resolves it through strategic coding so that everything starts to work fine. Production/Implementation: This is the stage where the product sees the light of the day i.e. it is launched to the audience. Maintenance: This remains an ongoing process to monitor the working of the product and eliminate any issues that the users might be facing. This stage also focuses on adding updates to the current version of the product in order to stay relevant. Termed as the rapid development method, the Agile way is all about eliminating the shortcomings of the Waterfall approach. 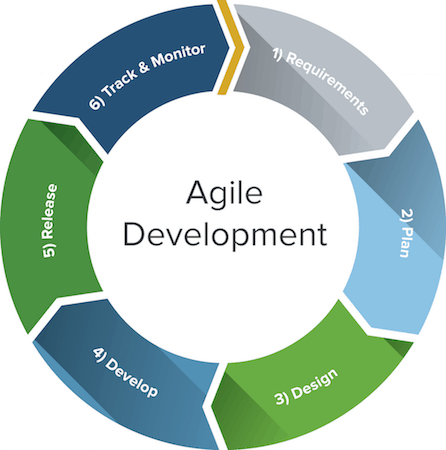 The Agile method has several variations to it such as the Scrum, Kanban, Extreme Programming (XP), Adaptive System Development (ASD), and Feature-Driven Development (FDD), of which Scrum happens to be the most popular one. The number of steps under this method of development can vary depending upon the requirement of the project. However, here is a generic procedure of how things follow through. After carefully brainstorming, the designing team arrives on a design and breaks the process of accomplishing this design into modules. These flexible modules are expected to be completed in weekly or monthly sprints. At the end of each sprint, the tasks are tested and evaluated. All existing bugs are identified and fixed. All feedback is introduced so that the design can get better. The strict nature of this methodology ensures that the deadlines are defined and set. With clear deadlines, the tasks are duly taken care of and the costs are well estimated. All terms for the project are well laid. There is a flowchart to follow and the team is clear on the tasks. Since there is no going back in the process, any inefficiencies will have to be taken care of only by going all over again in the cycle. This can incur more costs for the project. The end users get to witness the product only after the completion of the entire cycle. Hence, the client/stakeholders/audience might have to wait longer than expected. The entire development process is rapid and results show up quickly. There is always a scope to go back and make corrections to the design, if needed. Since a larger part of this methodology involves constant user feedback, the product design and end results are user-driven. This approach gives way to teamwork and enhanced communication practices. The flexible approach to this methodology can lead to the extension of the deadline if the team members slack on their part. A lot of revisions can end up producing a product that is far different from the initial mockup. The right approach for delivering your web development commitments can only be arrived at if you are aware of the requirement. With the guide above, we hope that you will be able to recognise the most suitable method of web development for your next project and be able to deliver an awesome end product.